The patent details a system which appears to create the effect of talking through a glass to the other participant in video communications. Originally filed in October 2014, the system was patented last month by Microsoft Corporation, listing inventors as Adrian Travis and Andreas Georgiou. It incorporates a display device that presents an image which looks to be coming from a point located behind the display. 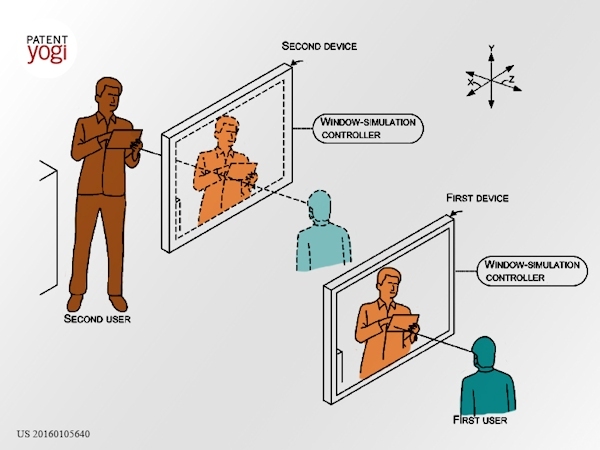 When paired with another remote display each participant can see the other user’s environment through a glass-like material. Technology deployed includes a steerable array of beam-deflecting facets and a large area camera with low etendue (allowing light angles to be conserved). The telepresence system facilitates communication via voice and body movement between participants, and could possibly lead the way for how remote employees participate in meetings in the future. Microsoft is clearly investing heavily in its development of AR products, after introducing its Room2Room system allowing participants to interact with a life-size projection of another person earlier this year.